CREDITS: Opened for David Copperfield, The Temptations and Wierd Al Yankovic. Presents his Crazy Comedy Stunt Show! After captivating audiences for over two decades, Roberto The Magnificent emerges as one of the best variety acts performing today. Never has there been such skill and comedy combined in one outstanding and unique entertainment package. Roberto�s success is based on his wild comedic antics and his amazing stunts. This spectacular act, appealing to all ages, is filled with snappy patter, brilliant choreography, audience participation, and lots of daring stunts. 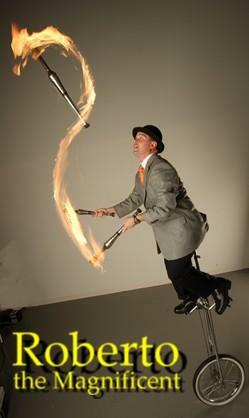 During the course of the show, Roberto The Magnificent fills the stage with energy and action, riding unicycles and pogo sticks, juggling knives and torches, spinning saws, all while keeping the audience laughing. Roberto learned to juggle and unicycle at age 11. Within four years he won a silver medal at the World Juggling Championships. Now with over twenty-five years of performing experience, Roberto is a proven success on three continents. Roberto has appeared at over 10,000 events from civic performances, major fairs, schools, festivals, and sporting event halftimes- the appeal of Roberto The Magnificent is universal.